Back in April, FreedomWorks released its principles for fundamental tax reform. With these principles in mind, this post will take a look at the framework, explaining how it would overhaul the tax code. Individual Tax Rates: Currently, there are seven income tax brackets, ranging from 10 percent to 39.6 percent. The framework consolidates and lowers individual tax rates. Although the framework specifies three rates -- 12 percent, 25 percent, and 35 percent -- it also calls for a near doubling of the standard deduction to $12,000 for an individual filer and $24,000 for a married couple filing jointly, effectively lowering the current 10 percent tax rate to 0 percent. Unfortunately, the framework didn't provide details on the income levels to which the rates would apply. This level of detail is presumably being worked out now, although the framework does note that the goal is to increase wages, so one can assume that virtually taxpayers will see an increase in their tax home pay. The framework also includes language floating the possibility that "[a]n additional top rate may apply to the highest-income taxpayers to ensure that the reformed tax code is at least as progressive as the existing tax code and does not shift the tax burden from high-income to lower- and middle-income taxpayers." Some have floated that this could be a surcharge rather than an additional rate. Most staffers to whom we have spoken doubt that the additional rate or surcharge will come to fruition. The framework also proposes the elimination of the individual alternative minimum tax. Broadening the Tax Base and Tax Simplification: The framework eliminates most tax deductions and loopholes in the tax code, keeping the mortgage interest deduction, the charitable deduction, and the child tax credit in place. As mentioned, the framework nearly doubles the standard deduction. The mortgage interest deduction would exist in name only, as the vast majority of tax filers will opt for the increased standard deduction rather itemize. Only 30 percent of tax filers itemized in 2013, according to the Tax Foundation. The framework proposes expanding the child tax credit to compensate for the elimination of the personal exemption for dependents, although specifics aren't provided. It would also allow for an additional $500 non-refundable credit for non-child dependents. One target for elimination is the state and local tax (SALT) deduction is already getting some pushback from Republicans in high-tax blue states, like California, Illinois, and New York. The elimination of the SALT deduction and the gutting of the mortgage interest deduction will be a big fight in the upcoming weeks. 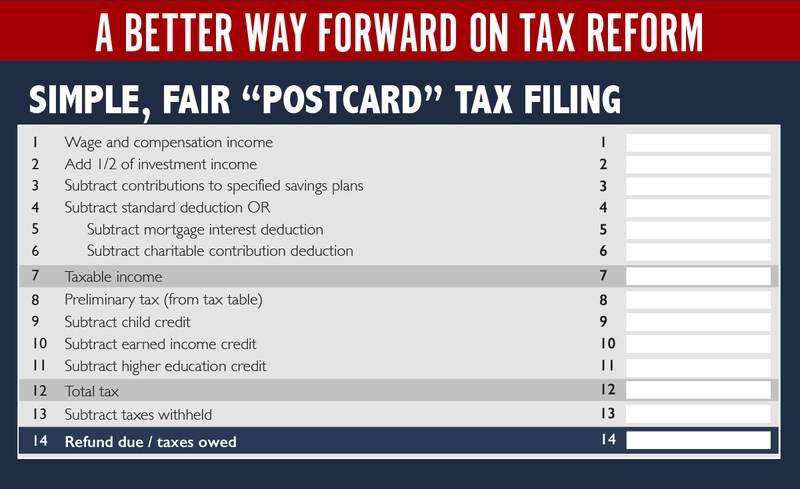 But these changes are key to simplifying the tax code, making filing as easy as filling out a postcard. Corporate Tax Reform: Currently at 35 percent, the United States has the highest corporate income tax rate in the industrialized world. The framework proposes setting the corporate income tax rate to 20 percent. It also lowers the pass-through, or small business tax rate, from 39.6 percent to 25 percent. While the framework would eliminate many tax corporate tax deductions and credits, it would allow for five years of full and immediate expensing of capital investments. The United States would move to a territorial tax system under the framework, taxing profits earned only inside the country. There would be a one-time tax of profits currently held overseas. The framework also calls for the elimination of the death tax and the corporate alternative minimum tax. Again, there are details that have to be provided before we can ascertain the full scope of the framework. Unfortunately, some are trying to smear the framework and the positive impact it will have on the lower and middle class. As explained above, the individual rates are provided, but the income levels to which those rates apply aren't. But the Tax Policy Center (TPC) published a study on Friday that made unfounded assumptions, claiming that it would impact some income earners, including some in the lower and middle class. The rollout of the framework is only the first step in the process. Before the Congress of jurisdiction can get to a tax reform bill, it must pass a budget resolution with instructions for the committees of jurisdiction in the House and Senate to report a reconciliation bill meeting certain budgetary targets. The House will bring its budget to the floor this week, while the Senate Budget Committee will markup its own budget Wednesday and Thursday. For those who need a quick refresher, reconciliation allows Congress to pass legislation that directly relates to revenues, outlays, or debt. This process allows the Senate to bypass a filibuster, allowing the chamber to pass reconciliation bills with 51 votes. This process can take time. In 2001, H.Con.Res. 83 was introduced on March 23 and passed the House on March 23. It was amended in the Senate on April 6, requiring the House and Senate to resolve differences. From start to finish, it took 49 calendar days to complete the process. The 2003 tax cut legislation was kicked off with the passage of H.Con.Res. 95. This budget resolution took less time to push through both chambers. Introduced on March 17, 2003, H.Con.Res. 95 passed its final legislative hurdle on April 11, 2003, taking only 26 calendar days. As of Monday, October 2, there are 36 legislative days remaining on the House schedule in 2017. Currently, the House is scheduled to adjourn for the rest of the year on Thursday, December 14. Both chambers can, of course, add more days to the calendar, including weekends. The goal, from what we've heard, is to produce a conference report relatively quickly once both chambers have passed their own budgets. But the goal should be to pass fundamental tax reform by the end of the year.